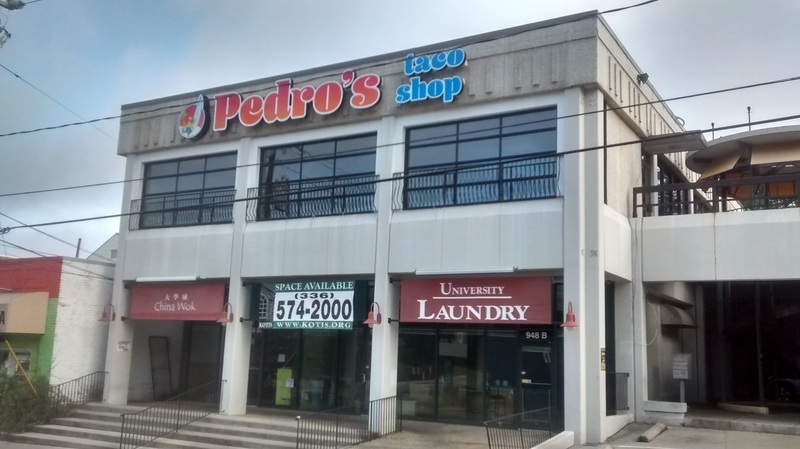 A worker on the upfit of the new Pedro’s Taco Shop says the restaurant should be open around the time classes start at UNCG on August 22. It will occupy the top floor of 948 Walker Avenue, former home of Los Cabos and, before that, La Carreta. Exterior signs went up late last week, and the parking lot (on top of the parking deck) was resurfaced this week. Mexican food would seem like a natural business for Tate Street. The two previous restaurants, though, lasted for only a few years each before closing. There are any number of reasons why a new small business might close, of course, and restaurants especially. Here’s hoping Pedro has great food and figures out the puzzle of the restaurant business on Tate Street. In the meantime, there’s no word on what, if anything, is happening downstairs at 948 Walker in the former University Laundries location. Tables, chairs and other items have been moved into the space, but no progress has been seen since that stuff arrived a few weeks ago. The business district is staging a nice recovery from the slow-motion exodus of businesses over the past couple years (Addams bookstore, the leasing office for The Grove apartments, Los Cabos, Taste, Thai Garden, The Space, University Laundries). Four new businesses now have opened or have been announced this summer. They’re all restaurants or similar businesses (what category does the Smoothie King fit into? ), again raising the longstanding question of how many eating places the business district can support. The former Addams location is still under contract. What will become of the former movie theatre is expected to be announced soon, but no one is quite ready to talk about it yet. This entry was posted in Businesses, Tate Street, Walker Avenue and tagged Pedro's Taco Shop, Tate Street business district. Bookmark the permalink.